Geographically, Voivodina lies in the Carpathian Basin. The Magyars (hungarians) invaded this part of Europe in the begining of the 9th century. During the centuries and after many wars, the Hungarian kings invited other ethnicities, such as the Saxons from Germany, to settle and fill the place of the decreased Hungarian population coused by wars and a long period of the Turkish Rule. Other groups, such as the Serbs, came to Voivodina later, but mostly fleeing from the upcoming turks from the south, and accepted in Hungary as refuges or soldiers fighting the turks, but were always granted shelter and a right on practising their ortodox religin althought it was opposite to hungarian predominantly Roman Catholic. Their first groups are mentioned in chronicles dated the 13th century, quoting them as poor shepherds wandering with their flocks from sothern Serbia to seek asylum and refuge in Hungarian territory. The Province of Voivodina is an autonomous province north of Serbia, containing about 27% of Serbias total population according to the 2002 Census. It is located in the northern part of the country, in the Pannonian plain. Its capital and largest city is Újvidék (serb. Novi Sad), at over 300,000 people, while its second largest city is Szabadka (serb. Subotica). Voivodina has six official languages, and there are more than 26 ethnic groups in the region. 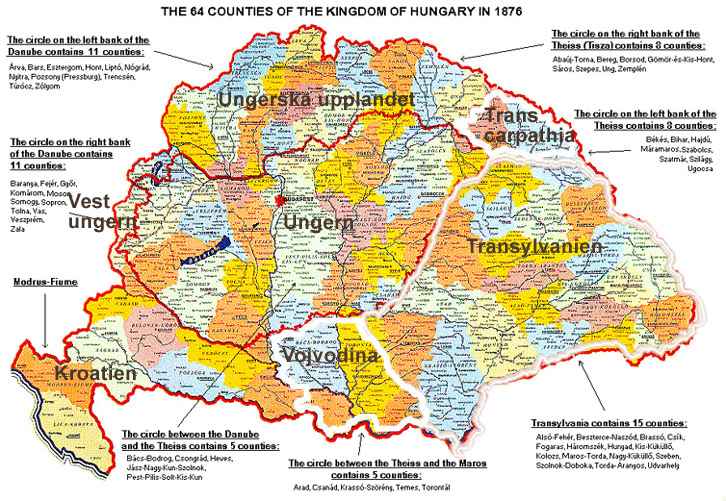 Voivodina had been the integral part of the Kingdom of Hungary since 1000 a.d. until 1921. At the end of World War I, as part of the Treaty of Trianon, 1920, the Allies annexed Voivodina from Hungary to Yugoslavia, however, the region remains a treasury of the one-thousand-year old Hungarian culture and people in the Carpathian Basin. Geographically, Voivodina lies in the Carpathian Basin. [Webmaster note: The Magyars invaded this part of Europe in the begining of the 9th century. See "Magyar Conquest of Hungary"]. During the centuries and after many wars, the Hungarian kings invited other ethnicities, such as the Saxons from Germany, to settle and fill the place of the decreased Hungarian population coused by wars and a long period of the Turkish Rule. Other groups, such as the Serbs, came to Voivodina later, but mostly fleeing from the upcoming turks from the south, and accepted in Hungary as refuges or soldiers fighting the turks, but were always granted shelter and a right on practising their ortodox religin althought it was opposite to hungarian predominantly Roman Catholic. Their first groups are mentioned in chronicles dated the 13th century, quoting them as poor shepherds wandering with their flocks from sothern Serbia to seek asylum and refuge in Hungarian territory. In 1456, three years after he captured Constantinople, Sultan Mohammed II encamped and set off to besiege Nándorfehérvár (today's Belgrade), hungary´s last and strongest defence fortress on south against turkish attacks. Serbia has been already occupied by the turkish army. The Hungarian army was led by the hungarian king János Hunyadi. In that decisive battle Hungarians gained a decisive victory. This triumph at Nándorfehérvár turned back for nearly a century the Ottoman expansion threatening Europe. In Christian churches throughout the world, the pealing of the bells at noon still reminds people of the victory János Hunyadi achieved on July 22, 1456. Years that came were full of uprisings of different kinds (peasants, miners) within the kingdom. The country was weaker and weaker as time passed by. Is it any wonder that, after all this, there was not enough money for the war against the Turks, even legendary Nándorfehérvár fell in 1521. In the turbulent times after the battle at Mohacs (1526) the self-declared Serb despot, Nenad Chernoevich, conquered most of Voivodina with his army consisting of Serb, Tot, Olah and Bulgarian armed peasants. The Slavs who settled the towns of Voivodina at that time, actually never returned to their motherland Serbia, they instead stayed in Voivodina´s towns and its region. The whole of Voivodina was conquered by the Turks at the beginning of 1542. In 1543 the region was already a part of the newly organised Szeged- Sandzak (district). The country was occupied by the turks in over 140 yars, even Budapest, the capitol was taken. Szeged was liberated by count Gyorgy Wallis in 1686 consequently, after this followed Szabadka(Subotica), and the whole of Voivodina was liberated as well. Though the county was liberated from the Turks, the towns in many ocasions were completely destroyed: deadly silence reigned the enormous plain with gloomy swamps and deep forests and the peoples who used to live here had no trace at all. During the years that follow Orthodox and Catholic Serbs were settled and their task was to fight the Turks at any time. The territory was considered a border guard-region. Voivodina, the complete Transdanubia and Croatia too, as borderlands were served as terrains and scenes for deployment in countless battles against turks, on that way the number of hungarians rapidly decreased, the ethnic picture started to change. In 1683, things "worked out" exceptionally well for the Turks: they had already reached Vienna in mid-July. Europe joined forces, and the united Polish, Bavarian, Saxon, and Austrian armies under the leadership of the Polish king, raised the siege of Vienna and crushed the sultan's army. During succeeding years, which were filled with chaotic wars in the Carpathian Basin, the Christian coalition continually gained the upper hand. The Turks, who three years before were besieging Vienna, were in 1686 unable to hold Buda against the regular army of liberation, reinforced by volunteers. The commander of the fortress, Abdurrahman Pasha, fell in a dogged battle. Of the 65 thousand soldiers of the victorious Prince Charles of Lorraine, every fourth one was Hungarian. When in 1986, on the three hundredth anniversary of the successful siege of Buda Castle, the participants in an international conference of historians in Budapest debated the military events of 1686 and their background, the general opinion was that though the Christian forces had waged the military operations that forced the Ottoman Empire back to the Balkans not out of devotion to the Hungarians but in the obvious interest of all Europe, the recapture of Buda during their campaign was decisive and far-reaching in its effect: after all, from this time on, the Turks were increasingly on the defensive. This military victory made it possible for Hungary to be a part of Europe again after a century and a half, and the clogged arteries of development again opened for the nation. The government and the large landowners invited foreigners to settle in the regions depopulated by frequent military operations: Germans, Southern Slavs, and Northern Slavs. Even today, the rows of villages established by the state administration are easily identifiable through the symmetrical networks of streets that were laid out by military engineers. The spontaneous migration of people was also large. Slovakians, Ruthenians (Carpatho-Ukrainians), and Rumanian forest dwellers and shepherds moved down mainly from the impoverished valleys of the Carpathians into the interior of the basin. A large segment of the inhabitants in the growing cities were also foreigners: Germans, Serbians, Bohemians, Moravians, and others. But first from Mayerling to Sarajevo... Incidentally, the writer of these lines is not surprised if someone summarizes Hungary's history in a way that, reaching the middle of the nineteenth century or even beyond that, it still holds in reserve half of its fixed length. Is this due to the pressure of accelerated time? To the glut of events? That history, moving on foot or horseback until this point, has now boarded a steam locomotive or an airplane? That the number of sources is increasing? That the charm of propinquity enthralls -the participation of our grandfathers, who died only yesterday or are still living here and there, in the events, and the direct impact of bygone events on our individual destinies? Still, let us try to hold to our own condensed endeavor and its differently proportioned course. Before the turn of the century, the economy of the Austro-Hungarian Monarchy, which for decades had lived within its given borders, was comparatively stable and dynamic -its money, for example, was sound; however, its political structure was shaky and its society full of tensions. Even bourgeois developments had not reached fruition; a whole range of rights to liberty and rules of democratic procedures was lacking. The labor movement was already rumbling about establishing its own much more far-reaching objectives. The ideal of internationalism, proletarian internationalism, loomed seductively like a utopia, behind the whirl of fulfilled national and minority aspirations. The relations between the Hungarians and the nationalities in the Carpathian Basin within the Monarchy were simultaneously characterized by the belief that those relations were regulated by a sound law of nationalities, that ample opportunities for emancipation were available to Slavs and other ethnic groups, including Jews (many of the most radical representatives of the struggle for the nationalities studied in Budapest, they lived or found self-awareness there; their movements took root there, they published their newspapers there), and that the tectonic force that always rent the Monarchy asunder ever more catastrophically could be sought in these very relations. The assessment of this massive emigration, as a result of which separate Hungarian settlements and big-city colonies -sometimes ghettos- came into existence in the United States, Canada, and several South American countries (some emigrants did not master the official language of their new country for generations) -this assessment is almost entirely negative to this very day. This is the case even though there was no European country at the level of economic, technical, and demographic development at which we ourselves arrived at the turn of the century that did not also undergo the same experience. Today, one of the causes of the economic dead end in numerous Third World countries is precisely the fact that the Wild West, the great open spaces, the pampas where the temporary "human surplus" could emigrate are no longer to be found anywhere. For Hungary, however, it is a great benefit, both economically and morally, that no matter where we may find ourselves in the world, we encounter Hungarians, kinfolk who are to some degree, preserving their Hungarian character and their consciousness of their origin. And they also visit the old homeland frequently. Let us now approach the internal strains of the Monarchy from an entirely different perspective. The only son of Queen Elizabeth's four children, the "ill-fated" heir Rudolf, was born back in 1858. He was his mother's child. His nervous system was rather vulnerable; he had an intellectual bent, he was eager to become emancipated, he was on friendly terms with scholars (among them, the great zoologist, Alfred Brehm, the author of The World of Animals); he was repelled by the court and also by his father's coldness, dogmatism, and rigid sense of duty. Naturally, a bad marriage was arranged for him. He knew about his father's petty love-affairs: about his almost cohabiting relationship with the actress Katherine Schratt, whom Elizabeth the wife herself recommended as a "substitute", about the back street of a back street that posterity learned about only recently: his fifteen-year relationship with the beautiful Anna Nahowski, who bore several children during this period, during her husband's complete absence. And Katherine and Anna: they were easygoing silly-minded, domesticated petty bourgeois, the direct opposites of the refined, indeed decadent Elizabeth. And what kind of companion did Rudolf require? Several kinds also? After all, in addition to his flirtations at the court, he kept returning faithfully to a notorious Viennese prostitute, a popular but not exactly intellectual coquette. Then, half blind, he fell into little Marie Vetsera's net. At the time of their short and stormy relationship, Rudolf was a developed personality, to the extent, one can say, knowing his unsettled frame of mind. There was not the faintest hope that his father, aging but enjoying remarkable health, ever intended to hand over to his only son any real part of his power. Even if measured by the standards of an heir to the throne, Rudolf performed his third-rate duties indifferently enough; he preferred to spend his time hunting, and following and promoting research in the natural and social sciences. And he conducted publicistic activities. He wrote articles. Under a pseudonym. In the liberal, in the opposition press. Was it some kind of Oedipal rebellion against his father? His Majesty's Opposition within the family? A youthful caper? Something more serious, perhaps. Rudolf truly viewed the future of the Monarchy differently. It is true that after several years of disinclination his father too was forced to acquiesce to Christian Socialist Karl Lueger becoming the mayor of Vienna. The times mandated it. And besides, Lueger was a confounded left-winger but a bigoted Catholic and a rabid anti-Semite. At best, Francis Joseph I made involuntary concessions. Rudolf would have liked to go forward. Toward a republic. Mayerling, January 1889. Do Baroness Marie Vetsera and Rudolf die a shared death of their own will? To this day, efforts are being made to explain and unravel the secret of this tragedy in various ways. There are a thousand versions, ranging from the most simple romantic love death to the emperor himself ordering the murder of his son, whom he had cast out of his heart, together with his lover, because he was a political rival. Let us mention the version maintaining that the political assassin was a German, an agent of Berlin; after all, Rudolf's anti-Prussianism was widely known. The truth is not exactly simple but, in the end, quite prosaic. His father, in a peremptory manner, ordered Rudolf, who had long been nursing thoughts of suicide, to break with his love. There was no outlet or popular support for Rudolf's political ambitions. His mood grew ever gloomier. The syphilis that did not spare even him tortured him increasingly. And in the hunting lodge near Vienna, an incompetent midwife botched an illegal abortion on Marie Vetsera, who had become pregnant after only a few intimate liaisons. Rudolf -this is what we think- to ease the demise of the gradually hemorrhaging Marie, shot her in the evening and then himself in the head at dawn. The Hungarians knew him as a friend and mourned him as a martyr; romantic legends sprang up about him, about a "good prince" who had been murdered. September 1898. Luigi Lucheni, an Italian anarchist born in Paris and a guest worker in Switzerland -he was that, although the expression itself was not yet known then- was indecisively rummaging about among crowned heads and similar parasites because he was convinced they all had to be slaughtered. While running amok, he, almost by chance, thrust his sharp-pointed and dagger-like file -he did not have the money for a dagger- directly into Queen Elizabeth's heart in Geneva. He struck down the most blameless of the crowned "spongers" in Europe, the one who, if she had been asked, would, in all probability, have agreed with most of the anarchistic principles espoused by her assailant. Her life, which she lost so senselessly, had indeed been a complete burden to her for a long time. Death was a deliverance. Archduke Francis Ferdinand, a cousin from a collateral line, took Rudolf's place. The new heir to the throne was arrogant; he had ravenous appetite for politics and was not exactly an indecisive character. Although he also offended the emperor with his morganatic marriage, and the emperor him by barring his children from succession to the throne, their views contained many kindred features. But Francis Joseph I did not share power with him either. He increased Francis Ferdinand's sphere of influence in minute portions only. With the military occupation of South Slavic Bosnia and Herzegovina (1878), which took place to impose a burden on Turkey, the sick man of Europe, but worked against Serbia, the sharp turn toward expansion in the Balkans put the Hungarians in a delicate position. Our agriculture benefitted. But the growing number of Slavs in the Monarchy caused anxiety, and military action led to the shedding of blood -mainly that of the fanatics- and the ranks of the Hungarian forces took station even less willingly in the garrisons of the hostile and wild southern provinces than in the north, in Polish Galicia. This is the way we saw it. At the same time, in the Balkans -and not just there- the greedy expansion of the Monarchy and the recent annexation of the Slavic population produced ever sharper rebuffs -and so did the Hungarians' active role and expanded participation in these events which brought them the benefits of usufruct. At home, the Kossuth ethos of oppositional sentiment faded; the flames of the spectacular fireworks of the Millenary celebrations blazed up and then died out. Kossuth's two sons returned from exile, but one of them soon fled to Italy again, to become an engineer there; the other son, Ferenc Kossuth, could have become a major political personality, but did not have a personality. A whole series of significant laws were passed; apparently, the couple of decades following the Compromise were truly a new age of reform. High-speed mechanical presses poured out newspapers, the country became a secular state, and public education was made more mundane and practical. Bourgeois equality before the law evolved; a bourgeoisie has also existed, but only a small fraction of the population could achieve the status of a citizen. The framework of parliamentarianism was similar to Western Europe's. But it could have been filled out with real meaning only on the basis of more modern suffrage. With regard to this issue -and such things have happened before- Vienna would yield, indeed would have liked to allow more than the dominant social classes in Hungary were willing to accept, or bear. Sometimes Vienna made the effort to rule by military governance but then the spirit of the Bach period haunted the scene on both sides: in the organization of opposition, of passive resistance -sometimes constitutionalism was again brought forth from the repository of instruments. The lack of land and the fact that the larger part of the areas newly reclaimed and protected from floods and made cultivatable wound up in the hands of the old landowners, and the bulk of the benefits from the periodic agrarian booms were also theirs, produced agrarian socialist organizations. The greedy new industries also nurtured the labor movement, whose noted organizer, Leo Frankel, was one of the directors of the Paris Commune in 1871, returning to Hungary after its collapse. At the turn of the century, a political personality of a greater stature finally appeared on the scene: Count István Tisza. However, he emerged from the conservative wing. His aggressive activities filled with intrigues are explained, in part, by the fact that after the turn of the century a purblind political jungle war replaced the reconciliation of ideas, principles, and programs in the Hungarian Parliament. The members of parliament discovered obstructive tactics and developed them to a superb degree: the parliamentary "slow-down strike", which crippled the almost unformed bourgeois state mechanism to the point of paralysis with an endless prayer wheel of speeches, frequent roll call votes, etc. And all this occurred at the time when Francis Joseph I, forgetting the humiliations of the not-so-distant Prussian-Austrian War and ungrateful to the court of the Russian czar who saved his throne in 1849, entered into a most binding alliance with the voracious German Empire. The Austrian-Hungarian relationship, which reached its latest nadir in 1905, was of vital importance to the development of the military forces. Amid the violent internal turns and struggles of the next, brief decade, Vienna and Budapest reached many compromises in the interest of the survival and functioning of Dualism, but the question of the army was the area in which Vienna made the fewest concessions. Nevertheless, at the beginning of the 1910s, a wing of the Austrian high command did see clearly that the Monarchy was too weak to face the major clash that threatened. Perhaps it was this that supplied the background for the notorious Redl affair; possibly, this head of the Austrian spy agency who was "unmasked" in 1913 and forced to commit suicide was not a traitor to his country but a clear-headed skeptic. Among the leading Hungarian politicians, the one who, perhaps, best sensed the dangers of an early entry into the war was the one who, it must be added, had done so much to reforge the Monarchy: István Tisza, who was then serving as Prime Minister of Hungary for the second time and whom the greatest Hungarian poet at the turn of the century, Endre Ady, hated so much because he saw him as a true adversary among the numerous contemporary politicians of small caliber who, precisely because of the range of his visions and determination, bore an extraordinary responsibility for the destiny of the nation. But Tisza's resistance was able to delay the entry into the war for only two weeks. The military maneuvers in the southern region, which Crown Prince Francis Ferdinand viewed in June 1914, were extremely provocative. It was purely fortuitous, on the other hand, that the half-amateurish assassination attempt made against him succeeded on the second try; even his unfortunate wife died with him. At most, the Serbian student, Gavrilo Princip, accelerated events with his pistol shots at Sarajevo. The assassination was not the cause. It is not our task to trace the events of the next four years in detail. World War I was what it was. Almost every part of Europe, as well as other regions, participated in it; consequently, our picture of it is as various as the participants. Despite all preceding events suggesting something else, the war atmosphere, indeed its hysteria, seized the majority of Hungarian public opinion; Hungarians believed that they would be able to hail their victorious forces by the time leaves fell; hundreds of thousands sang, "Halt, halt there, beastly Serbia!" Serious blunders by the army command, particularly in the beginning, accompanied the Monarchy's participation in the destructive war with its prolonged seesawing but frequently stationary fronts. Francis Joseph I, who, he said, "weighed everything, considered everything" (his portrait prepared at this time was distributed throughout the Monarchy, showing him lost in deep thought, his royal face buried in his hands), often chose key commanders on the basis of order of prestige and subjective attachment; this colorless emperor-bureaucrat had extremely little feeling for talent -and casualties remained tremendously heavy to the end. It was a lamentable act of honor how the Hungarians, as well as soldiers from recently annexed Bosnia, distinguished themselves in bloody battles with their military skill and personal bravery. For Hungarians, the most painful memories were the circumstances and defeats in battles fought on the Russian front, in Galicia, for the fortifications at Przemysl, then in Brusilov's steam-roller offensive, and finally in the Italian and Slovene Karst region, on the plains of the River Isonzo. In the memory of entire generations were indelibly imprinted the scenes and events of brutal and bloody battles, the bayonet charges at Gorlice in southern Poland, the blockade of Przemysl, and the horrible trench warfare at Doberdo in the Karst region, then in Italy, now in Yugoslavia, where every incoming round was made even more dangerous by stone fragments. -1. The Monarchy collapsed. Not only did Hungary, as well as the newly created Poland, secede, but three "successor states" also came into existence in a semicircle: Czechoslovakia, Rumania, and Yugoslavia, which, in their given form, had no historical antecedents, or had such only in part. -2. Lenin's revolution in Russia began, after so many utopian plans, to form a living socialism. -3. The United States' acceptance of responsibilities in Europe made it into a decisive factor of power in world politics. -4. The inconsistencies and abuses of the series of peace agreements sowed the seeds of World War II. Prophecies boding ill were futile. Hungarians realized too late how strong and deep-seated the activities of the nationalities were. When in 1920 at Versailles, outside Paris, the new borders of Hungary were laid down after long but one-sided negotiations in the Trianon Palace, the territory of the Hungarian nation was mutilated into a third its size, and its inhabitants shrank to two-fifths their former number. Though the Entente Powers dictating the peace terms did not agree to every one of the most extreme recommendations and requests, the Rumanians, who gained all of Transylvania, would have gladly advanced farther west, all the way to the River Tisza; among the Czech and Slovak politicians there were those who wanted to establish a dividing corridor between Austria and Hungary cutting through west Transdanubia and Slovenia right down to the Adriatic, and also a Czechoslovakian port on the Adriatic coast; Yugoslavia, made up of Southern Slav peoples, would have definitely liked to possess, if not Szeged perhaps, then Pécs and its environs, and to this end it founded the short-lived Baranya Republic. By the time of the 1880 census, the number of Hungarians living in this area was ca. 330,000 (Tab. 20). They did not even reach 23 % of the population of the territory of present-day Voivodina (Tab. 21). This appears to be an exceptionally low figure if we consider the fact that during the Middle Ages, present-day territory of Voivodina and Eastern Croatia were almost completely ethnic Hungarian (Fig. 32). The number of Hungarians inhabiting this area greatly increased at the end of the 19th century and the turn of the century due to a high rate of the natural increase, state-initiated settlements (Székelykeve, Sándoregyháza, Hertelendyfalva, Tiszakálmánfalva, Gombos, Szilágyi, etc. ), and especially spontaneous migration from the north (Southern Transdanubia, Central Great Hungarian Plain) towards the south (Slavonia, present-day Voivodina). The outmigration from the overpopulated, above mentioned territories was motivated by economic reasons (first of all after the repeal of the Military Border in the south /1881/ and the parcelling of cheap landed properties). The peace treaty of Trianon, after the end of the First World War annexed the historical South Hungarian territories (Southeast Baranya, Bácska, Southwest Banat, with only 28 % Serbian population in 1910) to the newly formed Kingdom of Serbs-Croats-Slovenes. Between the takeover in 1918 and 1924, and due to the forcible and clear anti-Hungarian mesures 44,903 Hungarians (military personnel, administration employees, intellectuals, landowners etc.) fled to the new Hungarian state territory (Rónai A. 1938). Due to the ethnic oppression the Hungarians and Germans were overrepresented among the overseas emigrées. In fact, in 1925 half of Yugoslavian emigrées were Hungarian and German. In the case of the Hungarians, this was a direct result of the fact that in this period, 44 % of the Hungarians of Voivodina, adding up to then 41.4 % of the agricultural population of present-day Voivodina, were landless. The high proportion of destitute Hungarians between the two world wars can be attributed to the fact that the land of ca. 332,000 acres confiscated from the departed Hungarian and German big landowners - in order to dilute the Hungarian ethnic territory near the border - were distributed exclusively among 45,000 Serbian and 3,000 Croatian (Bunyevatz) colonists. As a result, a row of Serb village colonies were established near the most important ethnic Hungarian centers (Bácstopolya, Szabadka, Magyarkanizsa and Magyarcsernye): Lipar, Karadjordjevo, Novi ednik, Novi Beograd, Velebit, Dusanovo, Velike Livade, Vojvoda Stepa, Banatsko Karadjordjevo etc. The mass - voluntary and forced - Hungarian emigration, statistical separation of the previously voluntarily assimilated Germans, Croats (Bunyevats) and Hungarians with surnames of non-Hungarian origin from the Hungarians and manipulation of census data led to the decline of the Hungarian population especially in the ethnic enclaves of Slavonia, Baranya, the Transmura Region and generally in the towns of Bácska (primarily Szabadka and Zombor) (Figs. 33, 34, Tab. 22). In 1941, Germany and her - internal and external - allies destroyed the Great-Serbian state, the Yugoslav Kingdom. After the declaration of the Independent State of Croatia (April 10, 1941) and the German occupation of Syrmia and Banat, the Hungarian troops reannexed Bácska, Baranya and Transmura regions occupied by the Serbian and French Army in November 1918, containing the most Hungarians of the former Yugoslavia. Parallel to the emigration and displacement of ca. 25,000 between 1918-1941 immigrated Yugoslav - mostly Serbian - state employees and colonists from Bácska to Serbia, there was a settlement of military and civil servants from the former Hungarian territory and of Hungarians from Bukovina (13,200) to the territories once again under Hungarian administration. In addition, a significant part of the non-Hungarian (i.g. Jewish, German) intelligentsia once again declared themselves to be Hungarian. Thus it is understandable that the ethnic Hungarian population of the region again rose in the statistics to over half-million. Moreover, for the first time since its existence, Újvidék - the current provincial seat of Voivodina - was recorded as a majority Hungarian populated city with 50.4 % in 1941. (Tab. 22). The statistical increase of Hungarians in this region did not last long. In October 1944, the newly settled Hungarians (military forces, state personnel, politically compromised individuals and Székelys from Bukovina who had been settled in the colonies of the Serbian war veterans deported in 1941) fled. From those Hungarians who remained in Voivodina ca. 20,000 innocent civilians became the victims of the bloody Serbian vendetta in October and November 1944 (our estimation and see Cseres T. 1991). After the bloody anti-Hungarian retaliation, the Yugoslav government was not adamant about either declaring the Hungarians collectively responsible, or resettling them. As a result of the rapidly normalizing political situation, the growing natural increase and the Magyarization (German to Hungarian identity change) of ca. 30,000 persons from the remained in Voivodina Germans (mostly in the communes Zombor, Nagybecskerek, Apatin and Újvidék), the Hungarians were even able considerably to increase their population number in Voivodina by the late 1950s. The population of the province had been altered by 226,000 - Serbian, Montenegrin etc. - settlers from the Balkans between 1945 and 1947 (Gaæesa, N.L. 1984). On the other hand, the assimilation, emigration and aging of the population in the Hungarian ethnic enclaves of Slavonia and partly in Southeast Baranya continued. Beginning in the 1950s, the heavy migration caused by the high rate of Communist economic modernization and urbanization processes of the region significantly influenced national minorities, including that of the Hungarians. These migration processes, however, resulted in the increased disintegration and ageing - due to the migration and emigration of a large part of the young earners - of the previously closed rural society and ethnic communities. As illustrated in Fig. 35, between 1953 and 1991 the proportion of Hungarians living in decisively majority Hungarian inhabited (over 75 %) settlements especially declined, while the percentage of Hungarians living in "weak" (under 25 %) minority conditions increased. Emigrants from the scattered Hungarian settlements to centers with dominantly non-Hungarian speaking populations have embarked on the path of gradual linguistic assimilation due to ethnical mixed marriages and daily foreign language communication. Since the early 1960s, employment in Western Europe, especially in Germany, was a financially tempting possibility. It also contributed significantly to the decrease in the number of Hungarians. In most cases, people chose not to return. In 1971, the proportion of guest workers who were Hungarians from Voivodina (27.5 %) surpassed the population percentage of Hungarians (21.7 %). In the past few decades, the Hungarians primarily living in the economically underdeveloped region of South Bánát (Versec, Torontálvásárhely, Sándoregyháza, Székelykeve, Fejértelep, etc.) tried their luck abroad. The natural population growth, especially the compact Hungarian ethnic block of the Tisza region continued to decrease due to Hungarian migration to urban settlements and emigration abroad, as well as a consequence of demographical natural decrease, resulted from the changed family size of that region. In many cases, ageing and emigration were mutually reinforcing factors of population decline. The same applies to the isolated, disadvantageously located Hungarian ethnic enclaves in Bánát, Bácska, and Slavonia (Rábé, Egyházaskér, Alsóittebe, Káptalanfalva, Doroszló, Kórógy, Ójankovác, etc.). Under such circumstances, it is not surprising that in the case of the Hungarian ethnic group, already in the mid-1970s the death rate surpassed the birth rate. Incidentally, the compact Hungarian ethnic block near the Tisza, is an integral part of the demographic "crisis region" of the Carpathian Basin - characterized on the one hand by a low birth rate and on the other by a high suicide rate. This region, already in existence in the previous century, includes the Bánát region and Arad county in Rumania, Békés, Csongrád, Bács-Kiskun and Baranya counties in Hungary, and Baranya and Slavonia in Croatia. Due to the previously outlined migration processes, the percentage of Hungarians is decreasing in centrally located, urbanized areas - due to heavier non-Hungarian immigration - and is increasing in peripheral rural areas - along with population decrease and ageing. Among the subjective factors influencing the number of Hungarians in Voivodina, the most outstanding is the fact that at the time of the 1991 census, ca. 37,000 persons of Hungarian ethnic origin - as well as others - did not declare their national identity, but simply referred to themselves as "Yugoslav". At the time of the census 1991, 374,000 persons declared themselves as Hungarians in Serbia, Croatia and Slovenia. 91 % of them lived in Voivodina, 6 % in Croatia and 2 % in Slovenia. Both Kosovo and Voivodina were provinces with autonomy in Serbia, but the Serb precident Slobodan Milosevic ended this autonomy in 1989. At the time of the 1991 census, 339,491 people in Voivodina were recorded as having declared themselves to be ethnic Hungarian. Only seven of the communes had an absolute Hungarian majority in this period (Magyarkanizsa, Zenta, Ada, Bácstopolya, Kishegyes, Csóka and Óbecse). Hungarians with 42.7 %, were in the relative majority in the Szabadka commune and represented a strong minority in the communities of Temerin (38.7 %) and Törökkanizsa (33.8%). In accordance with the historical events and unique geographical environment of this region, its Hungarians inhabit primarily small towns (26.4%) and large villages (19.5%) (Fig. 36). Thus, the biggest Hungarian community (39,749) in Voivodina (and also Serbia) - 51,000 according to our estimates - inhabitted the city of Szabadka, but more than ten thousand Hungarians lived in Zenta, Újvidék, Nagybecskerek, Óbecse, Bácstopolya, Magyarkanizsa and Ada (Tab. 23, Fig. 37). Considering the ethnic proportions, Magyarkanizsa, Ada, Zenta and Bácstopolya were the "most Hungarian" towns (Tab. 24). As regards the non-urban settlements, there are 49 with a Hungarian majority in Bácska, 25 in Bánát and 2 in Syrmia (Szerémség). Among these, only Kishomok could be considered exclusively Hungarian. These settlements that can be considered to be mostly Hungarian are almost all located in the Horgos-Bácstopolya-Bácsföldvár triangle, in the Hungarian ethnic heartland of Voivodina that lies on the right bank of the Tisza. Apart from this, there are only 36 Hungarian majority populated ethnic enclaves in this region: e.g. Temerin, Gombos, Doroszló, Bácskertes, Bezdán, Ómoravica, and Pacsér in Bácska; Majdány, Szaján, Hódegyháza, Magyarcsernye, Torontáltorda, Torontálvásárhely, Székelykeve and Ürményháza in Bánát; Satrinca and Dobrodolpuszta in Syrmia (Szerémség, Srem). WHAT'S HAPPENING TO THE HUNGARIAN MINORITY IN Voivodina, SERBIA TODAY? The Statute of Voivodina which is the basic legal act of the province, permits, besides the Serbian language, the official use of four other languages of the largest national minorities: Hungarian, Slovak, Rumanian and Ruthenian. Except for the language, the population differs in religion so that the Serbs, Montenegrins, Rumanians, Romanies, Macedonians and Ukrainians are Orthodox, Hungarians, Croats and Ruthenians Catholic while Slovaks are Protestant. There is also a number of Muslims and other smaller religious communities. We know for a fact that the minorities of Voivodina has met a lot of problems due to the Serb authorities and their actions in the area after WW2. After the breakdown of Yugoslavia in 1991 the situation has hardened even more. information and fact about Voivodina.